With Friday’s deadline to tender contracts to arbitration-eligible players firmly in the rearview mirror, a slew of viable free agents have hit the market. There are no stars, to be sure, but there’s a little bit of everything to be had amongst the forty-plus players that are now available for nothing more than cash. With that in mind, I will profile some of the players that could conceivably make sense for the Yankees, based upon their current stated and positional needs. And, given just how many names there are on this list, I decided to put them in alphabetical order instead of trying to sort by preference. Please note that I’m providing the arbitration projection for each player in place of a salary estimate. The reason for this is that I’m operating under the assumption that many of these players were shopped in the hopes of getting something in return, but they couldn’t find any takers – so none of these guys are likely to start a bidding war, and will likely earn a bit less than they would’ve through arbitration. Avilan has been a relatively consistent lefty-specialist for seven years now, holding LHH to a sub-.700 OPS in six of those years. Same-handed hitters hit just .217 against him last year, which is right in-line with his career norm of .210. He’s not flashy, and he’s a liability against righties – but he could more than adequately fill a role in any team’s bullpen. The only red flag here is his velocity, which slipped by over 1 MPH in 2018; lefty specialists aren’t always known for their stuff, but a dip of that magnitude is never a good sign. Whether Avilan makes sense for the Yankees is kind of up in the air, as is the case with every other reliever on this list. If the team wants to strengthen its bullpen, there are certainly better options out there; but, if there’s a budget in-play, Avilan is a solid option. Beckham will never overcome the bust label that has been firmly affixed for half a decade now, but he was a solid utility infielder in 2016 and 2017. 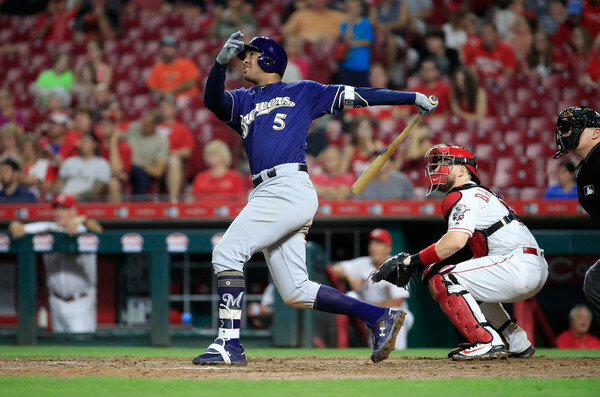 He played more than passable defense at second, third, and short, and was a league-average hitter in both seasons; he showed flashes of more than that after being dealt to the Orioles at the 2017 trade deadline, as well. But, alas, 2018 was his worst big league season on offense and defense. His walk and strikeout rates trended in the right direction, but not significantly so – and that was about it. So why is he here? Put simply, the Yankees need infield depth and Beckham has played all four positions. And he’s played them well at times, to boot. Even with the bust designation, he had three years of solid utility work and he’s still in what should be the prime of his career – so it wouldn’t be shocking if he could get back to that level. It’s not glamorous, but there’s value in a utility infielder that can swing a league-average bat. I wrote about Brandon Belt – who is owed over $50 MM over the next three years – a few weeks ago, and discussed how often worthwhile first base options are available. I bring that up now because Bour (119 wRC+) and Belt (122) have had almost identical production over the last three years, and Bour was just non-tendered by a team that fancies itself a contender. 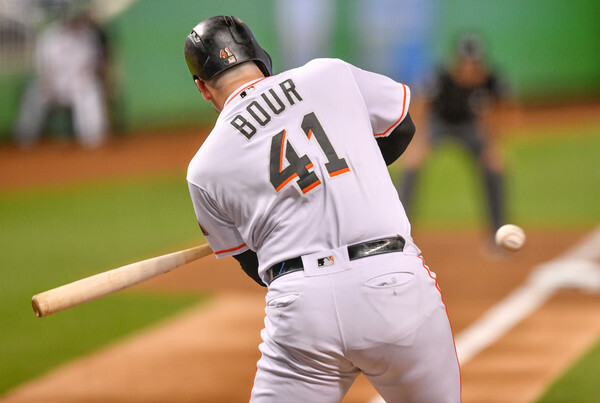 Bour is coming off of the worst season of his career by wRC+, but he posted a career-best 14.6% walk rate and still socked 20 dingers. You could do a great deal worst at first, and the Yankees largely have post-Teixeira. Bour makes sense as a target if the Yankees are moving on from Greg Bird. And, given that he’s best-suited as the larger side of a platoon (he had a 123 wRC+ against RHP last year), he could work quite well with Luke Voit. Boxberger’s overall numbers don’t look terribly enticing; quite the opposite, actually (aside from the strikeouts). However, it’s worth noting that he, like seemingly everyone on the Diamondbacks, fell apart in September as the team slid out of contention. Heading into the final month of the season, Boxberger was sitting on a 3.45 ERA in 47.0 IP, with 33.8% strikeouts and 12.1% walks (as well as a 50% groundball rate). The walks are still high, but he was otherwise a rock solid closer until that horrendous month. And his number from the first five months of the season are right in-line with his career norms. Relievers fall off of a cliff out of nowhere all the time, to be sure – but Boxberger has enough of a track record to suggest that his September was a slump. And I could see him being a legitimate weapon for whatever team signs him. I wouldn’t mind if that was the Yankees. Bush is here purely as a buy-low candidate, and probably a minor league deal guy. He was excellent in 2016 and very good in 2017, but injuries and struggles helped him fall out of favor in Texas last year. He’s also here because, even with the injuries, his fastball sat at 96 MPH last year, and his fastball spin rate ranks among the elite at 2550 RPM over the last three years. That’s the fourth-best spin rate among the 268 pitchers to throw at least 1000 fastballs since the beginning of 2016. Hell, it’s 15th among all pitchers with at least 100 fastballs thrown in that time. Bush has had injury issues and he’s not young, but there’s a lot to work with here. Cedeno missed nearly all of 2017 with forearm soreness, but you wouldn’t know that from how well he performed in 2018. The walks are a bit high, but they’re balanced nicely by his strikeout rate and his ability to burn worms – he had a 54.4% groundball rate last year, which is in-line with his career rate of 50.9%. I kind of buried the lede here, though, as Cedeno’s another lefty specialist. Though, he’s more effective against lefties than Avilan, and may therefore make more sense in a highly-specialized bullpen. 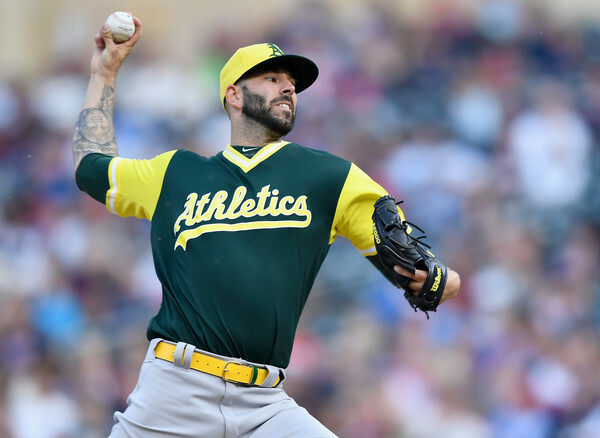 Fiers has carved out a respectable career as a league-average starter in nearly 900 IP. He has been incredibly inconsistent from year-to-year, though; to wit, his ERAs over the last four years are 3.69, 4.48, 5.52, and 3.56. His FIPs follow the same pattern, as do his strikeouts, walks, and home runs. In short, you never know what you’re getting with Fiers (aside from high home run rates – it’s just a matter of how high). That being said, he’s also a guy that’s made at least 28 starts in four straight seasons, and has value as a back-end starter that could give you a bit more. He’s low on the list of pitchers that I’d like to see the Yankees look at should other options fall through, but I could see Fiers making sense; but he’s something like the tenth best starting pitcher on the market. It seems like Flores has been around forever, doesn’t it? I suppose being a three-time top-hundred prospect and making your MLB debut at 21 will do that. Flores was a solid utility player for the Mets over the last four years, sitting a tick above league-average with the bat and providing acceptable glovework at first, second, and third. He’s a high-contact hitter, striking out in just 9.8% of his PA last year, and he has enough pop to drive pitches over the fence to all fields. He’s probably no better than average in any facet of the game, but, aside from a lack of walks (6.8% last year), he doesn’t really have a glaring weakness. If the Yankees are looking for a temporary placeholder at second with the hopes of him moving to the bench when Didi Gregorius returns, the could do a heck of a lot worse than Flores. Hey, it’s another lefty specialist! Or, maybe not, depending on how much stock you put in recency bias. Over the course of his career, Jennings has had a minimal platoon split, holding lefties to a .296 wOBA and righties to a .317 wOBA. He’s been deployed largely as a match-up guy, but he’s face more righties than lefties owing to the fact that his managers have been comfortable leaving him in to face more than one good lefty. Last year, however, Jennings was battered by righties, allowing a .310/.399/.528 slash line. Ouch. Guys like Jennings who rely on grounders (55.4% for his career) are scary in Yankee Stadium – but if the team’s looking for a specialist, he makes sense. I was kind of surprised to see Parker non-tendered, as he was very good for the Angels over the last two years. The only black mark was a 1.63 HR/9 last season, which should be neither overlooked nor harped upon. Parker’s not the bullpen ace that he looked like for most of 2017, but he feels like the type of free agent that will get a great deal less than similar players due to the lack of name value and stigma of the non-tender. A reunion with the Yankees could make sense, with the hopes that his home run rates normalize of course. Schoop reminds me a bit of Starlin Castro, in that the obvious talent is there, but always feels just out of reach. The 27-year-old has big-time power and athleticism, but he’s among the most impatient hitters in the game, with a swing percentage that’s nearly 10 percentage points above league-average. That worked well in his career-best 2017, when he posted a 122 wRC+, and found him wanting in 2018. The power’s undoubtedly there, and he’s an average defender at second – but Schoop will only go as far as his BABIP takes him. If you look at his average season, Schoop makes sense as a stop-gap second baseman. Without much in the way of versatility, though, I don’t like the fit. Shoemaker missed most of 2017 and 2018 with nerve issues in his forearm that required two separate surgeries. That’s scary. And yet there’s a silver lining, as he returned to make six starts in September, with his stuff fully intact. His 4.94 ERA is ugly, but Shoemaker racked up strikeouts and limited walks, and looked entirely like the pitcher he had been prior to his forearm problems. Granted, that means he’s been a largely back-end starter, not unlike the aforementioned Mike Fiers – but, as I’ve said before, there’s value in that. I prefer Shoemaker to Fiers, if the Yankees have the need to deep-dive into this end of the starting pitching pool. But both should be essentially considered emergency options. Full disclosure: I’m only including Solarte because he’s been bandied about a bit on Yankees Twitter. I’m not sure if that’s because he’s a former Yankee, but he has slipped as a hitter and defender in back-to-back years, and doesn’t strike me as the type of player in-line for a big bounce-back season. Wilson has been a steady albeit unspectacular reliever for four-plus years now, plying his trade by avoiding walks and keeping the ball on the ground (49.2% grounders in 2018). He’s something of an interesting case in terms of approach, as he throws three pitches, and they’re all fastballs – a four-seamer, a sinker, and a cutter, to be more specific. Wilson mixes it up by changing his usage rate of all three from game-to-game, and it’s been enough to keep hitters off-balance so far. Whether or not that would work in a more hitter-friendly park is up in the air.